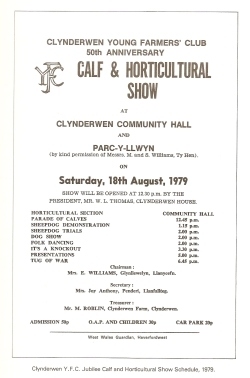 The origins of Clunderwen Show can be found amongst the history of Clynderwen Agricultural Society, established in 1911, and the formation of Clynderwen Young Farmers Club, established in 1929 as the first club in Wales. The role of the Agricultural Society was to foster improvement in livestock, crops and horticulture, through the medium of exhibition. 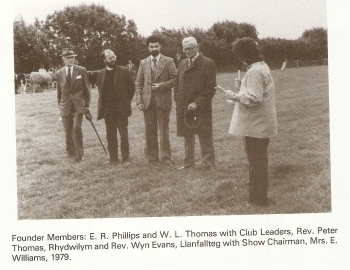 In a bid to attract younger members, the Young Farmers Club was established by the then secretary Mr E R Phillips. Young Farmers Clubs of this day (1929/30) were required to keep something that lived or grew, and the Clynderwen Club decided on cattle. It became a calf club, and club members were expected to each rear a calf. 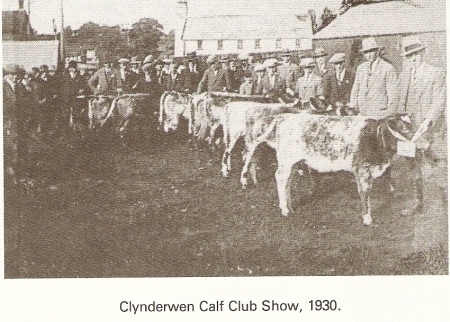 In 1930, the Clynderwen Show Society incorporated a special class for the calf rearing project in its annual schedule 1930. 35 well reared calves were shown on parade – a grand sight that attracted enormous attention. The first three prizes were won by three brothers – the Griffiths’s from Penlan, Clunderwen – all of whom were also champion ploughmen. The Clynderwen Agricultural Society Show had gone into abeyance in 1963 having been inaugurated in 1911. 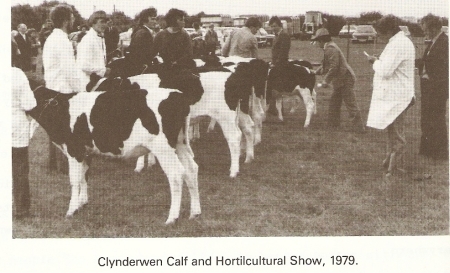 However it was decided to re-introduce the Clynderwen Calf and Horticultural Show in August 1979 with a Jubilee event. It was part of the Clynderwen Y.F.C.’s 50th anniversary celebrations that the show as we know it today was ‘re-kindled’. Held at Clynderwen Community Hall and Parc y Llwyn, various competitions included a parade of calves, sheepdog trials, folk dancing and Tug of War.